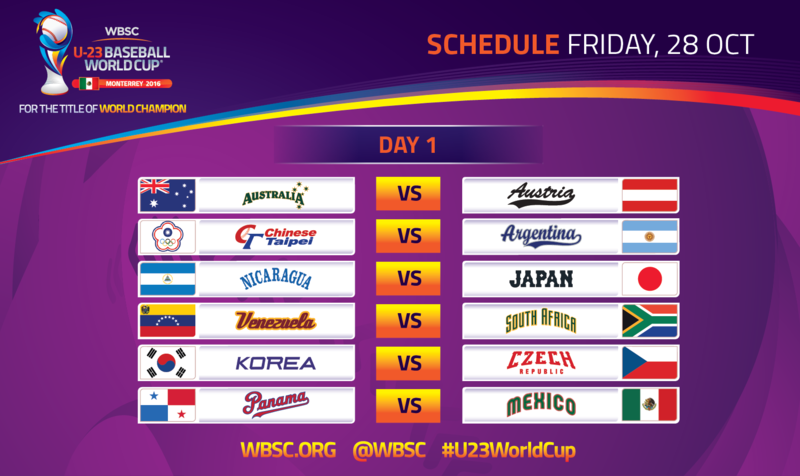 LAUSANNE, Switzerland -- The World Baseball Softball Confederation today announced the Official Competition Schedule for the upcoming WBSC U-23 Baseball World Cup® 2016, which opens Friday, 28 October, in Monterrey, Mexico. The U-23 Baseball World Cup is the top international baseball tournament of the year, distributing 690 world ranking points to the champion -- the third-largest award, following the top-tier international flagships PREMIER12® and the World Baseball Classic. The Official Microsite of the U-23 Baseball World Cup has also been launched in five languages, including English, Japanese, Korean, Spanish and Traditional Chinese. The top-ranked nation in Africa will meet the top-ranked nation in South America when No. 7 Venezuela and No. 36 South Africa battle on Day 1. No. 3 Korea will meet No. 14 Czech Republic to open their World Cup -- both nations have risen to historical highs in the rankings. Korea claimed the bronze medal at the U-21 Baseball World Cup 2014. Rivals -- No. 7 Mexico and No. 15 Panama -- will face-off in the featured host country match. World No. 33 Austria will make its World Cup debut against Oceania's top-ranked nation, No. 13 Australia, which will be Game 1 of the tournament. No. 4 Chinese Taipei -- world champions at the U-21 level -- and No. 27 Argentina will open together. Top-ranked Japan and No. 18 Nicaragua will also meet on Day 1. Japan captured the silver medal at the U-21 Baseball World Cup 2014, while Nicaragua advanced to the bronze medal match. Baseball World Cup, starting with a 30-game Opening Round (Group Stage). Alongside the Super Round, a Consolation Round will be staged to determine 7th to 12th Place. The top two U-23 National Teams emerging from the Super Round will meet For the Title of World Champion on Sunday, 6 November, at 18:00. The Bronze Medal Match will be staged at 12:00. The 16,000-seat Estadio Francisco I. Madero, home of Mexican Baseball League (LMB) club Saraperos de Saltillo, has been added to the line-up of venues for the inaugural U-23 Baseball World Cup 2016. Estadio Madero was renovated in 2011 and features the largest high-definition (HD) video scoreboard in Latin America at 14m x 22m (46 ft. x 72 ft.). Estadio Madero will join 27,000-seat Estadio de Béisbol Monterrey -- home of LMB club Sultanes de Monterrey -- and Estadio de Béisbol Polideportivo Tigres as the three sites of the U-23 Baseball World Cup 2016. The inaugural U-23 world championship in Monterrey is an expansion of the U-21 Baseball World Cup, which was launched in 2014. At the U-21 world championship in 2014, the rosters of National Teams included players from clubs affiliated to the Australian Baseball League, Chinese Professional Baseball League, Korean Baseball Organization, Major League Baseball, LMB, Nicaraguan Professional Baseball League and Nippon Professional Baseball.